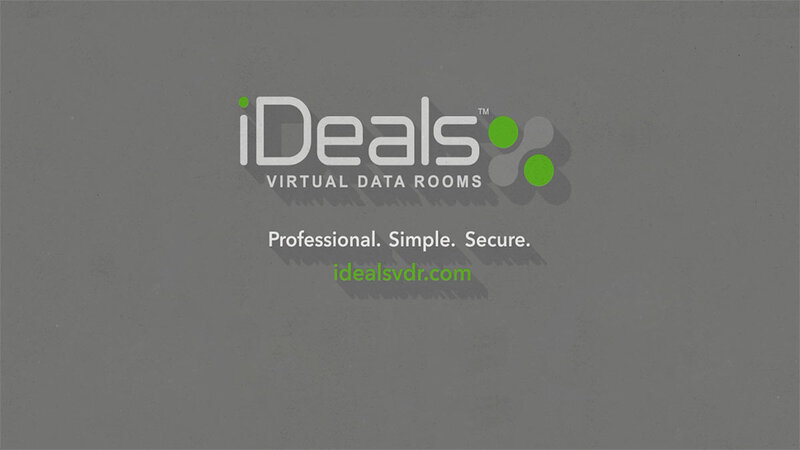 iDeals Virtual Data Room is an amazing VDR option, with all the functionality you could expect from an industry-leading virtual data room provider. The emphasis is on facilitating due diligence in any industry, including M&A, real estate, biotech, and technologies. 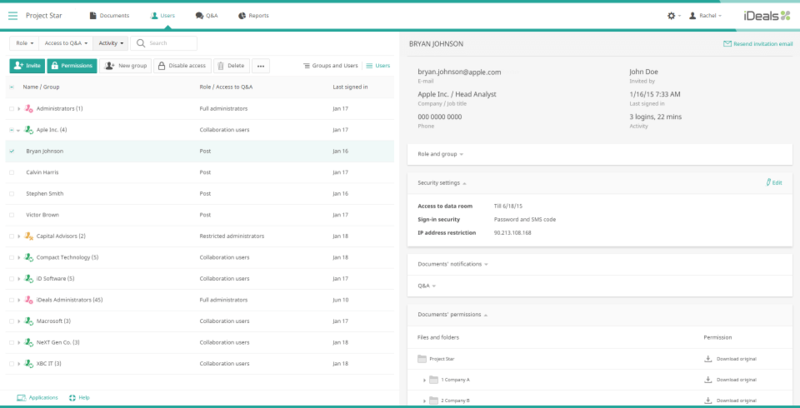 Eight user access permission settings can applied on an individual or group basis, and users can be allocated a permission profile that allows them access to particular files and folders. 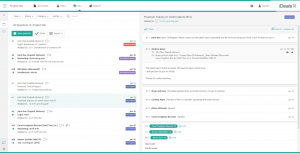 All user activity is tracked and time stamped and made available in audit logs. 256-bit encryption, automatic watermarking, antivirus protection, and many other safety-related measures ensure maximum protection for the confidential data. With many competing vendors requiring users to download plug-ins or other software, such as Flash or Java, iDeals works consistently across all web browsers, operating systems and devices with no plugins required. Full mobile compatibility ensured by dedicated apps for iOs and Windows. 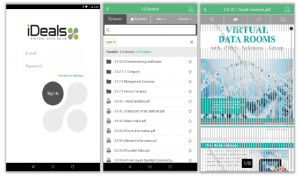 Secure, powerful, flexible yet intuitively accessible with a great user experience and multi-language 24/7/365 customer service, iDeals VDR platform is available either as a web service or integrated with the enterprises existing infrastructure. Free trial version is allowing to personally evaluate all the benefits of this virtual data room. I am genuinely glad to read this blog posts which includes lots of valuable data, thanks for providing such data. Very nice post. I simply stumbled upon your weblog and wanted too say that I have really loved surfing around your blog posts. In any case I'll be subscribing in your ffeed and I'm hoping you write again soon! Have you ever considered about adding a little bit more than just your articles? I mean, what you say is important and all. However imagine if you added some great photos or video clips to give your posts more, "pop"! Your content is excellent but with pics and videos, this site could certainly be one of the greatest in its niche. Fantastic blog! The product and service which iDeals offers are truly exceptional. Good prices, advanced features, and easy use even for novices. Highly recommended! The product has great functionality, which helped us to greatly improve due diligence. Our customers are also satisfied with our choice of the data room. We especially like the document access report feature because it helped us analyze the behavior of parties and even predict the outcome of the deal. I would like to thank iDeals team for supporting our company. With you I’ve had no worries about the security of our documents. I definitely recommend iDeals VDR to everybody. This is our third project with iDeals data room and we never had any problems with the functioning or any other complaints. It really has everything one might wish and I don`t think we could make a better choice. iDeals is an amazing and very intuitive data room. The features that are offered surpass the other data rooms we have used. The cost is very appealing and affordable. The support staff is readily available whenever I had a question. I am very happy with the switch to iDeals. Our clients also note that since we moved to iDeals VDR, the difference is great. It is much easier to work with the documents index, Q&A function, scroll through PDF documents, and other useful features. The VDR is very good, and I really want to note the top quality of customer support at iDeals. We had an appointed coordinator who provided an online session of training for our team. The service team was always ready when needed. Thanks! Our company previously worked with another VDR, and had several complaints regarding the system speed, complicated interface, and errors. We`ve started to cooperate with iDeals, and there is truly nothing more to desire. It is safe and easy and convenient. I wish we had chosen this provider earlier. I recommend iDeals to businesses who value the simplicity and functionality. 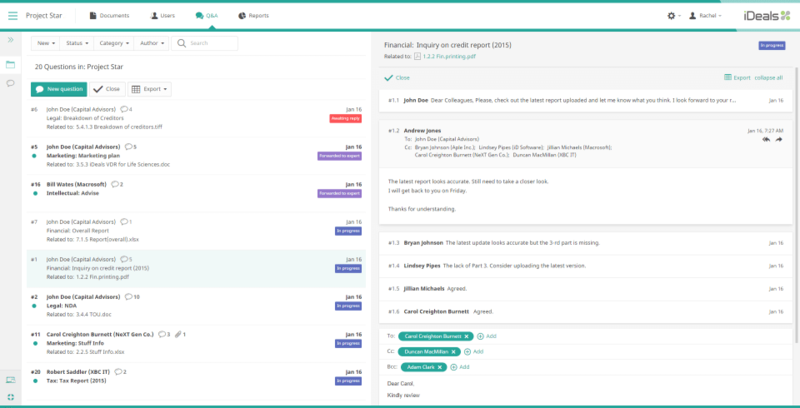 Easy to use, intuitive, nice audit track, We used several data rooms and iDeals I can fully reccommend. iDeals VDR has been very useful for my business. 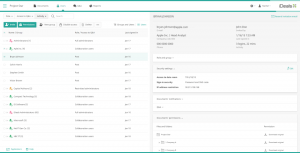 The major advantages for me were intuitive interface with full customization, a possibility to set limited access for users, and a reasonable price. I think that the offered options will suit even the most demanding users.